In today’s 5-4 ruling, the U.S. Supreme Court upheld Obamacare with conservative darling and chief justice, John G. Roberts, Jr., writing the decision, holding that the federal government may impose tax penalties on those who do not have health insurance. 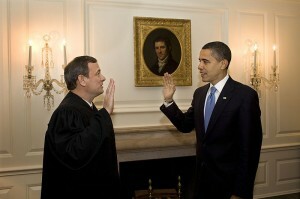 Roberts, a Roman Catholic nominated by former President George W. Bush, joined the four liberal justices in upholding Barack Obama’s health care plan as being constitutional. The individual mandate for every American to obtain health coverage was upheld, and those who cannot afford it will be extended coverage through taxpayer-funded government programs. Hundreds of protestors gathered outside of the Supreme Court to express their disapproval of the ruling. Heretofore, many individuals, including conservatives and evangelicals, had adamantly been supportive of Justice Roberts, believing that he would save the country from the requirements in Obamacare, despite the liberal leanings of his associate justices. Roy Moore, former Chief Justice of the Alabama Supreme Court and president of the Foundation for Moral Law, had filed an amicus brief with the United States Supreme Court in the Obamacare case, called State of Florida v. Dept. of Health and Human Services. Moore’s organization had argued that, most significantly, the imposed federal law constituted a violation of the 1oth Amendment. After the issuance of today’s ruling, Moore released a statement declaring the decision as being unconstitutional. Rusty Thomas, author of The Kingdom Leadership Institute Manual, agrees. He states that he believes today’s ruling by the Supreme Court creates at least two significant problems for the country. On pages 107 and 128 of the final law, Christians who participate in health care sharing ministries are exempt from the “individual mandate” to obtain health insurance. However, in order to be eligible for the exemption, the health care sharing ministry must have been in operation since 1999. There are only three organizations nationwide that qualify under these terms: Samaritan Ministries, Christian Healthcare Ministries and Medi-Share. Participants in Christian health share programs are required live Biblical lifestyles, and may not use tobacco, illegal drugs, or have sexual relations outside of marriage. Christians who do not elect to participate in a health care sharing program may be forced to fund abortion services. The current health care law requires all Americans who are enrolled in one of the government-approved insurance plans that cover abortion to pay a separate monthly premium, which will be earmarked for funding abortions. As well, Obamacare only prohibits the use of government funds for abortions unless a state passes a future law to opt out of doing so. Rusty Thomas opined that Christians must remain loyal to Christ in light of today’s decision.